The first full day of the 2018 APMP Bid & Proposal Con was packed with opportunities to learn and network. May 16 began with a keynote by Christine Cashen, who focused on tips to “help you get what you want with what you got – because you have what you need.” With humor and a little bit of audience participation, Cashen emphasized small ways to be more positive, connect with others, and improve the world around you. The APMP California Chapter sponsored the morning keynote. After a networking break, sessions began. The sessions at the 2018 Bid & Proposal Con follow four main tracks: leadership and professional development, managing processes, win the business, and tools/tech. A few of the Wednesday sessions covered tools and tech, career development, strong executive summaries, and more. In between sessions were other scheduled networking breaks, including lunch. The day ended with the Celebration of the Industry, sponsored by Shipley Associates, the APMP California Chapter, AOC Key Solutions, and Privia. APMP Chair Jamie Ninneman recognized the accomplishments of chapters, individuals, and companies over the last year. 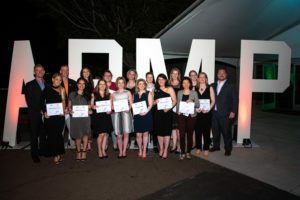 Several of the awards were new this year: the Chapter Member Connection, Executive Summary of the Year, and Vendor of the Year. He also recognized the second class of 40 Under 40 winners. Ninneman encouraged members to watch their email for future opportunities to recognize the young professionals who are already making an impact on their communities, companies, and industry. Read more about what happened at the beginning of the conference as well as highlights from day 1 and day 3. Save the date! Bid & Proposal Con 2019 will be June 3-6, 2019, in Orlando, Florida. Look for registration to open in early 2019.